How are you all doing today? I thought i would talk about something that i find to be the most important part of doing your makeup, be it for controlling oily skin, creating a smooth canvas to apply your base on to or to shrink pores and fine lines. 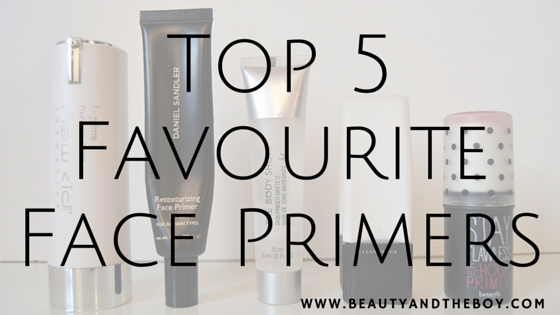 Today i wanted to share with you my Top 5 Favourite Face Primers that i have used.. Of course there are others out there that may be better but these are the ones ive used and loved, When i say i have tried a lot of primers i mean a lot so this is the best of probably 30 primers…obsessive i know haha. In the selection above you have the New CID Cosmetics i-prime, Daniel Sandler Retexturizing Primer, The Body Shop Matte It Primer, Illamasqua Satin Primer and the Benefit Cosmetics Stay Flawless 15 Hour Primer. First we have the New CID Cosmetics i-prime is as soft as silk this is mainly because it is a silicone based primer. The i-prime dulls down your imperfections, fine lines and makes your skin feel smoother, when applying it i like to apply to parts of the face that need it wait for a while for it to be absorbed then apply foundation, you can tell straightaway that the skin is smoother and the foundation just glides on, As for wear time i would say that it does extend the wear of foundation but not by much more than usual this primer as this is more of a correcting primer than extending wear. The Daniel Sandler Retexturizing Primer is again a silicone based primer which extends the wear of foundation as well as reducing the size of pores and fine lines. It contains an SPF of 20 which is important for the protection of your skin whilst in the sun but isnt sufficient enough to be used on its own. I think this primer has to be my favourite of the 5 simply because this is the one i get the best results with i can actually see a difference in how my skin looks and how long foundation/concealers lasts. This is best used for those of you who want an all rounder primer one that does everything from shrinking pores, extending wear time, concealing fine lines, smoothing out skin. The Body Shop Matte It Primer was quite a surprise to me simply because i never expected this to work as well as it does, it is a great dupe for the MAC Matte Primer which is a bit more expensive and you get less product as well. This primer works best at creating a smooth oil free matte surface to applying your base onto, I would say this primer is for those of you who just want something to mattify your skin if you don’t want a satin glowy finish. I wouldn’t say this extends the wear of your base by much but i doubt its supposed to as its a mattifier. The Benefit Cosmetics Stay Flawless 15 Hour Primer is great for those of you who may be oily or those of you who want your foundation to last much longer than it normally would. What do you look for in primers? I fell in love with the Dr Brandt Pores No More based on a Birchbox sample a year or so ago and am now on my second tube – it’s at the premium end of the pricing scale but I love it. I love benefit but the stay flawless primer just wasn’t a product for me, which is strange as I love the hello flawless foundation. I find the primer makes my foundation look really sticky and cakey, I was super disappointed with this one! I prefer porefessional much more! I’m also really loving the NARS pore perfecting oil free primer for this time of year! I havent actually tried any of these, so I have a lot of catching up! I haven’t found one Body Shop item that I don’t like, so that could be my starting point! This is a really great post! I’m looking at buying a primer for my oily skin but never really knew where to start so thanks for the recommendations! Loving your blog! I don’t always prime, mainly because I haven’t found one I love yet. I have noted these down! I am really liking the look of the Illamasqua one, I might need to try it next time I am near an Illamasqua stand. Recently I am loving the whole dewy look, I don’t really know why but I just do! My skin is quite dry so I think I will get along with it too. I love Benefit POREfessional! I really need to try some more, thanks for the recommendations.